Gelatine is an odourless, tasteless and colourless thickening agent, which when dissolved in hot water and then cooled, forms a jelly. It's useful for many purposes such as jelling moulded desserts and salads, thickening cold soups and glazing pates. Remove and squeeze out gently. For hot masses stir the squeezed out gelatine directly into the mass. The gelatine will dissolve immediately. 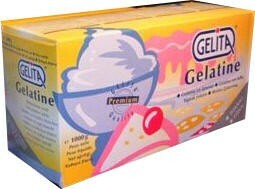 For cold masses eg cream, heat the squeezed out gelatine in a small saucepan and dissolve. Then stir a small amount of the cold mass into the dissolved gelatine, never the other way round. Stir this into the original cold mass and cool for at least 2-3 hours. Store dry and odour free.